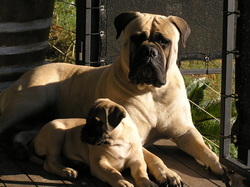 MINNIE 'CH Guarville Dream Switch"
Origin : The Bullmastiff was originally called the 'Gamekeepers Night Dog' as they were used to catch poachers. The base stock of the Bullmastiff was 60% Mastiff 40% Bulldog. They were created in the late 1800's. Our Bullmastiffs make very good companions and family pets, they also guard by nature and can be called the family protector. another fancier is born from your circle of aqquaintances. This is the greatest tribute to the breed.